Working with the church overseas. It has been our joy and privilege to work with the church in Rwanda for more than a decade. Messy church is a cooperation between St. Luke's and Holy Trinity Churches. For some of our work we join with other churches in Formby through Churches Together. 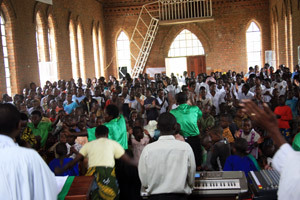 St Luke's is linked to the parish of Shyira, 25 miles east of Gisenyi, in north-west Rwanda. The link was arranged after a visit by one of our members to Rwanda and a subsequent visit to Shyira Diocese by a group of ten St. Luke's members. In agreeing to the link John Rucyahana, Bishop of Shyira, stated "We will be glad to work with you in the extension of the kingdom of God in both Shyira parish and St. Luke’s church." It was not clear at the time just how the link would develop, but Bishop John's prediction has come true. Shyira, in 2000/2001, was in a desperate situation. It had suffered terribly in the Rwandan genocide and subsequent incursions of militia who had fled into the Democratic Republic of Congo. We took on various tasks of funding the restoration of school buildings and rebuilding a maternity hospital - see the picture above. While the work was in progress personal friendships developed and there were more visits to Rwanda, and people from Shyira came to Formby. As the work of redevelopment in Shyira progressed we created a charity, the Shyira Trust to manage the financial aspects of the link while we concentrated on the link between churches and people. Sunday morning service in Shyira is shown alongside - it is very lively worship. Given talks on Rwanda to many organisations. Facilitated a visit from Formby Rotary Club to Rwanda, this leading to the club supporting 3 major projects in Shyira. Managed a project funded by UKaid from DFID through Global Community Links to bring people from Shyira to tell what the Millennium Development Goals mean to them.